The information contained in this website is general information only. It does not constitute personal financial advice and should not be relied upon as such. It does not take into account any investors’ individual circumstances, financial objectives or needs and does not purport to provide comprehensive information about any matter. An investment in any BetaShares Fund (‘Fund’) is subject to investment risk including possible delays in repayment and loss of income and principal invested. Neither BetaShares Capital Ltd (ACN 139 566 868 AFS License 341181) (“BetaShares”) nor BetaShares Holdings Pty Ltd guarantees the performance of any Fund or the repayment of capital or any particular rate of return. Past performance is not an indication of future performance. The information is not an invitation to enter into any legal agreement of any kind. No statement or information in this website constitutes a recommendation, offer or invitation to invest in any investments, securities or products of BetaShares. Before making an investment decision you should consider the product disclosure statement (‘PDS’) for the relevant BetaShares ETF with a financial advisor to determine if it is appropriate for your circumstances. You should also consult appropriate professional advisers on any legal, stamp duty, taxation and accounting implications of making an investment in a BetaShares ETF. The PDSs are available on this website. While all investors should consider the relevant BetaShares Fund PDS prior to investing, only investors who are authorised as trading participants under the Australian Securities Exchange (ASX) Market Rules (‘Authorised Participants’) may invest through the relevant BetaShares PDS. Other investors may acquire units in BetaShares’ Funds on the ASX through a stockbroker, financial adviser or online broker. Units may normally only be acquired and redeemed directly from a BetaShares Fund by persons called “Authorised Participants”. All other persons may acquire and dispose of units on the ASX via a stockbroker, financial adviser or online broker. Transaction costs (including brokerage fees or commissions) may be incurred when buying or selling units in a BetaShares Fund on the ASX. Units in a BetaShares Fund trade on ASX at market prices current at the time of trade, not, NAV or iNAV. The information on this website is provided in good faith and is believed by BetaShares to be accurate at the time of publication. However, the use of this website is at your sole risk. No company in the BetaShares Group, either personally or in their capacity as the trustee or responsible entity of any Funds, nor the directors and officers of BetaShares, make any representation or warranty as to the quality, accuracy, reliability, timeliness or completeness of any material on this website. Except in so far as liability under any statute cannot be excluded, BetaShares, its directors, employees and consultants do not accept any liability (whether arising in contract, tort, negligence or otherwise) for any error or omission in the material or for any loss or damage (whether direct, indirect, consequential or otherwise) suffered by the recipient of the information or any other person. This information relates to certain BetaShares Funds quoted on the ASX. ASX takes no responsibility for the content in this website or any decision to invest in the Funds. The admission by ASX of BetaShares as an issuer of ASX-quoted Funds is not an endorsement by ASX of BetaShares or the quoted units in any BetaShares Fund. The iNAV is calculated on a minute-by-minute basis by a third-party vendor (MarkIT) and is based on the market prices of the individual holdings included in the relevant index being tracked. The iNAV per unit does not constitute a bid-offer price. It is an indicative estimate only based on delayed intraday market prices obtained from the relevant exchange or market on which the relevant Fund’s assets are traded and are subject to change. The actual bid-offer prices for units in the fund are determined by market forces current at the time of any trade via the ASX. Any iNAV should not be relied upon as being the price at which units may be bought or sold on the ASX, and may not reflect the true value of a unit. No assurance can be given that any iNAV will be published continuously, will be up to date or free from error. The MarkIT information is provided to the users “as is.” Neither MarkIT nor BetaShares nor any of their affiliates make any express or implied warranties of any kind regarding the iNAV data, including, without limitation, any warranty of merchantability or fitness for a particular purpose or use. Neither MarkIT nor BetaShares not any of their affiliates guarantee the adequacy, accuracy, timeliness or completeness of the MarkIT iNAV data and to the extent permitted by law accept no liability to any person for any interruption, inaccuracy, error or omission, regardless of cause, in the iNAV data or for any damages (whether direct or indirect, consequential, punitive or exemplary) resulting from any use or reliance on the data. Prior to the execution of a security trade, you are advised to consult with your broker or other financial representative to verify pricing information. BetaShares may from time to time publish information, articles and other material on this website that are written and prepared by third parties who are not employees or representatives of BetaShares. Such material is provided for your interest and convenience only. The source of any such material will be clearly identified as an independent third party and BetaShares does not accept any responsible for the contents or accuracy of any such material, and the opinions expressed in the material should not be taken as opinions or recommendations of BetaShares. This website provides links to other websites operated by entities affiliated with the BetaShares Group as well as links to websites of independent third parties. Those websites which fall into the second category are not affiliated with BetaShares in any way. BetaShares does not control or endorse and is not responsible for the contents of these linked third party websites, and provides hyperlinks to other websites for your convenience only. Any information, opinions, representations or offers made in those linked third party websites are solely the responsibility of the third parties operating those websites and are not made by BetaShares, which makes no representation or warranty as to accuracy or reliability of the information in those websites. 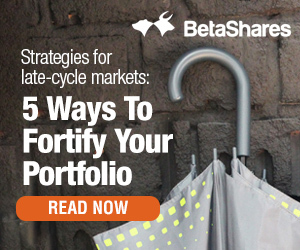 Past performance of BetaShares’ Funds is not an indication of future performance. No company in the BetaShares Group guarantees the performance of any BetaShares Fund or the return of an investor’s capital or any specific rate of return. Total return shown for BetaShares’ Funds have been calculated using net asset per unit at the start and end of the specified period after taking into account all fees and costs and assuming reinvestment of distributions. No allowance has been made for any entry fees, exit fees or taxation, if applicable. All figures and amounts displayed on this website are in Australian dollars unless otherwise stated. All asset values are historical figures based on our most recent valuations. Net asset values (NAVs) are based on closing prices from the previous trading day and are subject to change. As pricing frequencies and valuation methodologies differ for the various types of underlying assets, the asset values shown may not be current and, therefore, you shouldn’t rely on them as the basis for trading investments in your account. The intraday NAV per unit also does not constitute the market price per unit. It is an indicative estimate only, generally based on intraday values and is subject to change. Units in a BetaShares Fund trade on ASX at market price quoted on the ASX, not net asset value per unit. Transaction costs are incurred when buying or selling units in a BetaShares Fund on the ASX and brokerage commissions may also apply if such trades are done through a broker. The url www.betashares.com.au (‘this website’) is owned by BetaShares Holdings Pty Ltd ACN 136 545 107 and operated by it and BetaShares Capital Ltd ACN 139 566 868, a subsidiary of BetaShares Holdings Pty Ltd (collectively known as ‘BetaShares’ or the ‘BetaShares Group’). BetaShares® and Back Your View® are registered trademarks of BetaShares Holdings Pty Ltd. Unless expressly stated, the BetaShares Group is the owner or licensed user of the copyright and any intellectual property rights in any material, design, technology or concept contained on this website. All rights are reserved. You may use the information for your own personal reference only. You may reproduce the information in hard copy solely for your personal use. Except as permitted under the Copyright Act 1968 (Cth) or other applicable laws, this website or any portion of this website may not otherwise be reproduced, adapted, distributed, displayed, or transmitted to any other person or incorporated in any way into another document or other material, without BetaShares’ express written consent. The Funds are not sponsored, endorsed, sold or promoted by Standard & Poor’s and its affiliates (“S&P”) or by the ASX Operations Pty Ltd and its affiliates (“ASX”). S&P and ASX make no representation, condition or warranty, express or implied, to the owners of the Funds or any member of the public regarding the advisability of investing in securities generally or in the Funds particularly or the ability of any index to track the performance of certain financial markets and/or sections thereof and/or of groups of assets or asset classes. S&P’s and ASX’s only relationship to BetaShares is the licensing of certain trademarks and trade names and of the applicable index which is determined, composed and calculated by S&P without regard to BetaShares or the Funds. S&P and ASX have no obligation to take the needs of BetaShares or the owners of the Funds into consideration in determining, composing or calculating any index. S&P and ASX are not responsible for and have not participated in the determination of the prices and amounts of the Funds or the timing of the issuance or sale of the Funds or in the determination or calculation of the equation by which the Fund units are to be converted into cash. S&P and ASX have no obligation or liability in connection with the administration, marketing, or trading of the Funds. S&P and ASX do not guarantee the accuracy and/or the completeness of any index or any data included therein and S&P and ASX shall have no liability for any errors, omissions, or interruptions therein. S&P and ASX make no warranty, condition or representation, express or implied, as to results to be obtained by BetaShares, owners of the Funds, or any other person or entity from the use of the applicable index or any data included therein. S&P and ASX make no express or implied warranties, representations or conditions, and expressly disclaim all warranties or conditions of merchantability or fitness for a particular purpose or use and any other express or implied warranty or condition with respect to an index or any data included therein. Without limiting any of the foregoing, in no event shall S&P or ASX have any liability for any special, punitive, indirect, or consequential damages (including lost profits) resulting from the use of an index or any data included therein, even if notified of the possibility of such damages. Standard & Poor’s® and S&P® are registered trademarks of The McGraw-Hill Companies, Inc. (“McGraw-Hill”), and ASX® is a registered trademark of the ASX Operations Pty Ltd. These trademarks have been licensed for use by BetaShares. The Funds are not sponsored, endorsed, sold or promoted by S&P, McGraw-Hill or ASX, and S&P, McGraw-Hill and ASX make no representation, warranty or condition regarding the advisability of buying, selling or holding units in the Funds. BetaShares FTSE RAFI Australia 200 ETF: FTSE® is a trade mark owned by the London Stock Exchange Group companies and is used by FTSE International Limited (“FTSE”) under licence.The FTSE RAFI® Index Series is calculated by FTSE in conjunction with Research Affiliates LLC (“RA”). Neither FTSE nor RA sponsor, endorse or promote this product and are not in any way connected to it and do not accept any liability in relation to its issue, operation and trading. Any intellectual property rights in the index values and constituent list vests in FTSE. Fundamental Index ® and RAFI® tradenames are the exclusive property of RA. BetaShares Capital Ltd has obtained a full licence from FTSE to use such intellectual property rights in the creation of this product. “WisdomTree” is a registered trademark of WisdomTree Investments, Inc. WisdomTree Investments, Inc. makes no representation or warranty, express or implied, regarding the advisability of investing in securities generally or BetaShares WisdomTree Europe ETF – Currency Hedged or BetaShares WisdomTree Japan ETF – Currency Hedged in particular. Neither WisdomTree Investments nor any of its affiliates are involved in the operation or distribution of these Funds and neither WisdomTree Investments nor its affiliates shall have any liability for operation or distribution of these Funds or the failure of these Funds to achieve their investment objectives. Content on this website is directed at Australian residents only.